Details relating to the German Commemorative of 2010. This is the fifth coin in the German series featuring the provinces of Germany. This year is the town Bremen. Bremen together with Hamburg and Berlin enjoy the status of a province (Land) although they are in fact towns. In the inner circle we see the city hall together with the statue of Roland. These have been part of UNESCO’s World Heritage Series since 2004. The Bremen city hall is regarded as one of most important Gothic buildings – originally built 1405-1410 and refurbished 1608-1612. Roland is, in fact, the Patron Saint of Bremen, the oldest “Citystate” in the world. Germany is no longer identified as in the previous commemorative coins with “BUNDESREPUBLIK DEUTSCHLAND” but instead simply with “D”. This year it is shown in the outer ring between twelve and one o’clock. The year of issue 2010 is shown at the bottom of the outer ring.. The mint mark appears between ten and eleven o’clock on the edge of the inner circle and finally the initials, ”BB”, of the artist are seen at the bottom of the inner circle. As from 2013 onwards, the country designation and the year of issue appear within the inner circle as it was felt that the twelve stars of the EU should not be separated by anything as this detracts from the idea of unity! 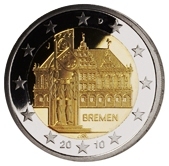 Return from German Commemorative 2010 to euro coin collector.